Who out there has a sweet tooth for all things chocolate?? My hand is raised! :) I am definitely a chocoholic. Since I am pregnant though, I try to watch my sweets intake to make sure I stay somewhat on a healthy diet for the sake of my baby. But, I think it is OK to splurge once in awhile and for sure, brownies are one way to get that fix in a hurry! Gourmet Gift Baskets is THE place to shop for gift baskets for all occasions. They have something for everyone and really, for all palates too. Perusing the site is a cinch too because they have things so nicely categorized and broken down into easy to find places...you really don't get lost at all when you visit them! Also, if you are looking for the perfect Easter basket then I would highly suggest checking out Gourmet Gift Basket's selection...awesome! Yum. Yum. Yum. So, as soon as we finished lunch today we dove into our box of goodies! I think the children's favorite was the Belgian Chocolate Chunk as it was chock full of chunks of chocolate. These brownies are not tiny either...they are pretty generously sized so if you eat one, make sure you have room for the whole thing!! I think my personal favorite was the Cheesecake flavor. I am a H*U*G*E cheesecake fan so if something says "cheesecake" on it, it's mine! This particular cheesecake brownie was very moist and rich in flavor. I think I took two bites and then saved the rest for later. It was VERY yummy. The full-sized Brownie Sampler retails for $34.99 and is deliverable to the lower 48 states only due to the perishable factor. 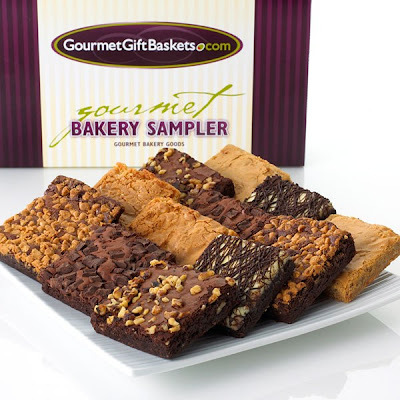 Gourmet Gift Baskets has offered to give away the exact same mini brownie sampler that I received to one of my readers! YAY! I am very excited to be able to offer this giveaway to you all. Here are your entry options! Disclaimer: I received no monetary compensation for this post. I did receive a free Mini Brownie Sampler for review purposes. All quotes and stock photos are from the Gourmet Gift Baskets website and email. Prize is being provided and shipped by the sponsor. All thoughts and opinions are 100% mine. Id love the Delux Junk Food Bucket! I like the gourmet carrot cake. I would love to try their Tour of Italy Italian Basket. I would love the Chocolate Gift Basket Premium - Sweet Decadence. I like the Ultimate Easter Gift Basket. I like the Afternoon In Paris™ - Non-Alcoholic Gift Basket. I like the Nature's Picnic Basket. Definitely try the Chocolate Gift Basket Classic - Sweet Decadence. Looks really yummy. I'd like the Champagne & Truffles Gift Basket™.